This week I’m going to do a mini-series on protecting your blog or website. 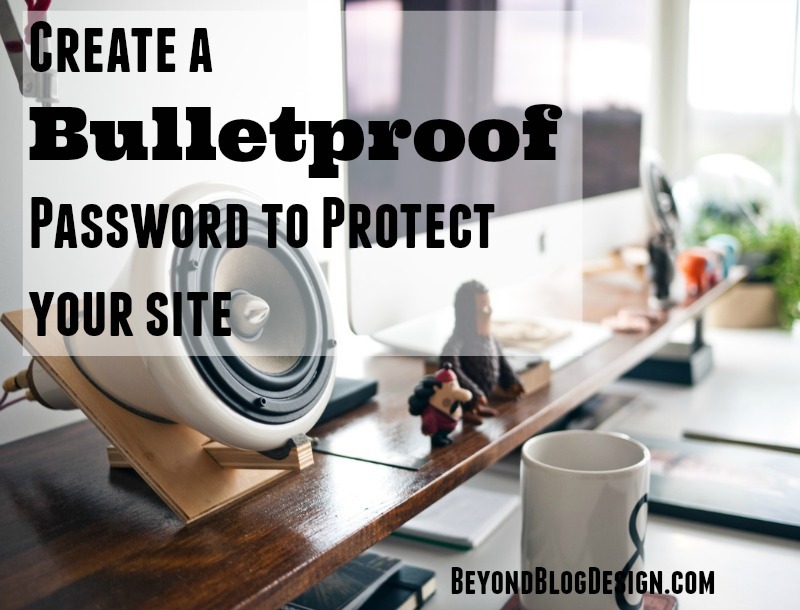 I think the most obvious place to start is with a bulletproof password. I participate in a lot of forums around the web. I would say the number one misconception I read is that small blogs and websites don’t need to worry about being hacked. Bloggers tend to think you need to have a lot of traffic to attract hackers. I learned first hand, that is not the case. One of the reasons I learned how to write code and build websites was because my site, Raised on the Radio, got hacked two years ago. I was just beginning, and starting to gain a small following, I had about 100-200 views a day, it was small but beginning to thrive. And then, within a week, everything fell apart. My site got blacklisted by Google and I had to shell out some serious money to clean it all up. In the end, I couldn’t save my site; so I moved it to WordPress.com and focused on my personal site and learning to code. I learned a lot of valuable lessons that week that I will share in coming posts. Not the least of which was the importance of having a bulletproof password. Even if you have a sucky password, you know that the best thing you could possibly do is have a strong password. What you might not know is you should also NOT have the word Admin as your login. What? No one told you that? Well I’m telling you. If your login is Admin, or someone’s login is Admin, I suggest you change that now. Just like www.pleasedonthackme.com/wp-admin is the most obvious login page, the most obvious login ID is Admin. Your password must NOT contain any pattern of numbers ie, 1234, 876, etc. Your password must NOT contain any name or word you can find in the dictionary. Yup. Not one single name or word. If you want to be safe, be a bot’s worst password nightmare. Leave your numbers in tact. Use any sentence you will always remember and you have a bullet proof password! What do you think? Even my mom can do it, so I know you can too! If you’re having any trouble with security or plugins, don’t forget to give me a holler for your free 30 minute consultation! I love this! So many people use the same passwords over and over – and don’t realize how easily they could be hacked. I laugh all the time when on TV or movies people guess passwords in a few seconds; birthdays, kids’ names, etc all of those easy ones. For A Limited Time My SEO Webinar is Free! Contact Us For a Free Consultation! Just Click the Phone.